Secretary of State Mike Pompeo said Tuesday that the United States had "identified at least some" of the Saudi officials involved in the killing of journalist Jamal Khashoggi and was revoking their visas. "These penalties will not be the last word on this matter from the United States. We will continue to explore additional measures to hold those accountable," Pompeo said. "We're making very clear that the United States does not tolerate this kind of ruthless action to silence Mr. Khashoggi, a journalist, through violence." The visa revocations were the first punitive actions the U.S. has taken against Saudi Arabia since news broke of Khashoggi's disappearance on Oct. 2. Pompeo, who made the announcement at the State Department, did not say who or how many Saudi officials would have their visas revoked. Saudi Arabia on Saturday announced it had already arrested 18 Saudis and fired several top intelligence officials in connection with Khashoggi's death. The secretary also said the U.S. was considering taking action, such as imposing financial sanctions, under the Magnitsky Act. That law was named for Sergei Magnitsky, a Russian lawyer who died in a Moscow prison after he reported tax fraud involving government officials; it was aimed at punishing officials responsible for his death. Earlier Tuesday, Turkish President Recep Tayyip Erdogan spoke for the first time about the Khashoggi case, saying the journalist was "murdered in a ferocious manner," and contending that Saudi Arabia carried out the killing in its Istanbul consulate in a premeditated plot. He dismissed Riyadh's claim that "rogue agents" were responsible. 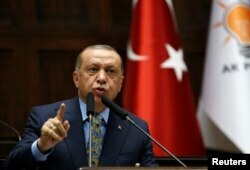 "All evidence gathered shows that Jamal Khashoggi was the victim of a savage murder," Erdogan told the Turkish parliament in Ankara. "To cover up such savagery would hurt the human conscience." The Turkish leader said "to blame such an incident on a handful of security and intelligence members would not satisfy us or the international community." Erdogan demanded that whoever ordered the killing of Khashoggi "be brought to account," and that the 18 officials already arrested by Saudi Arabia in connection with the killing stand trial in Istanbul. U.S. President Donald Trump talks to reporters about the killing of journalist Jamal Khashoggi in Turkey during a bill-signing ceremony at the White House in Washington, Oct. 23, 2018. 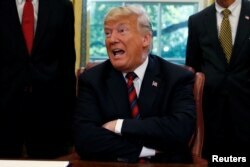 In Washington, President Donald Trump said Tuesday that Saudi authorities had staged "one of the worst cover-ups" in history with their response to the killing of Khashoggi, 59, a U.S.-based Saudi dissident. "They had a very bad original concept. It was carried out poorly, and the cover-up was one of the worst cover-ups in the history of cover-ups," Trump told reporters in the Oval Office. When a reporter asked Trump if Saudi Crown Prince Mohammed bin Salman, the country's de facto leader, should be held accountable, Trump said, "I spoke with the crown prince yesterday, and he strongly said he had nothing to do with this — it was at a lower level." Vice President Mike Pence said Erdogan's assessment of the killing "underscores the determination" of the Trump administration "to find out what happened. The word from President Erdogan this morning that this brutal murder was premeditated, preplanned days in advance, flies in the face of earlier assertions that had been made by the Saudi regime." "The world is watching," Pence said at an event at The Washington Post, where Khashoggi wrote opinion columns that were critical of the Saudi crown prince. "The American people want answers, and we will demand that those answers are forthcoming." Erdogan told Turkish lawmakers that "Saudi Arabia has taken an important step by admitting the murder. As of now, we expect of them to openly bring to light those responsible, from the highest ranked to the lowest, and to bring them to justice." The Turkish president described Khashoggi's death as a "murder" 15 times in his speech. Erdogan never mentioned Salman in his speech and did not play an audio recording of the killing that news accounts have cited. 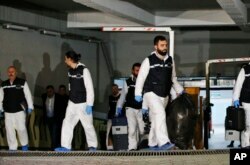 Erdogan gave new details surrounding the killing — which involved 15 Saudi agents who started arriving in Turkey on Oct. 1, the day before Khashoggi was killed — while largely confirming earlier news accounts of Khashoggi's disappearance, including that Saudi agents deployed a body double with Khashoggi's clothes, glasses and beard to walk out of the consulate to make it appear as if he had left the diplomatic outpost alive. The Turkish president said that on Oct. 1, a team of Saudi consular staff scouted out two separate locations in a forest outside Istanbul and at Yalova, 90 kilometers south of the city. Turkish authorities have searched the locations, theorizing that Khashoggi's remains might have been disposed of there, but have not found his body. Erdogan said Saudi agents removed the hard drive from the consulate's surveillance system. Saudi officials at first said that Khashoggi had walked out of the consulate and that they did not know his whereabouts. Then they said he died in a fistfight in the consulate. Most recently, the Saudis said Khashoggi was killed in a chokehold when he tried to leave the consulate to call for help. Turkish police crime scene investigators leave an underground car park, after looking for possible clues into the killing of Saudi journalist Jamal Khashoggi, on a vehicle belonging to the Saudi Consulate found by authorities a day earlier, in Istanbul, Oct. 23, 2018. "When the murder is so clear," Erdogan said, "why were so many inconsistent statements made? Why is the body of a person who has officially been accepted as killed still not around?" Khashoggi had gone to the consulate to get documents he needed to marry his fiancee, Turkish national Hatice Cengiz, who waited outside in vain for his return. Since Saudi accounts said a "local collaborator" had disposed of Khashoggi's remains, Erdogan said, "I am now asking: Who is this local collaborator?"